1. To make the compote, put all the ingredients into a medium saucepan with 1 tbsp water. Stir and simmer gently over a low heat for 15 mins until warm and syrupy. 2. Meanwhile, make the pancakes. Mix the milk, eggs and oil in a bowl. In another bowl, mix the flour, baking powder, sugar and 1 tsp salt. Stir the dry ingredients together, then slowly pour in the wet ingredients until just combined. 3. Heat a non-stick frying pan and add about 1 tsp oil. Pour in about 75ml of the pancake batter. When bubbles form on top, flip the pancake over and brown the other side. Keep the heat on medium so the middle cooks. 4. Keep warm in a low oven while continuing to make pancakes with remaining batter. 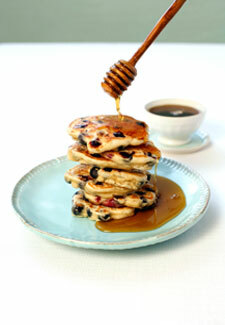 Serve warm pancakes topped with warm or room temperature compote.